Perfect for a summer barbecue, these simple Moroccan lamb kebabs can be prepared in minutes, or even ahead of time to make things even easier. Karen Burns-Booth adds plenty of flavour to her kebab recipe with fragrant fresh parsley, aromatic cumin and coriander, and the floral, spicy notes of harissa. I am a huge fan of kebabs – from succulent chicken to luscious beef skewers, they often feature regularly on my summer menu. They are easy to prepare and even easier to cook – they can be grilled, pan-fried or barbecued, and all you need to serve them is a big bowl of crisp salad and some crusty bread. 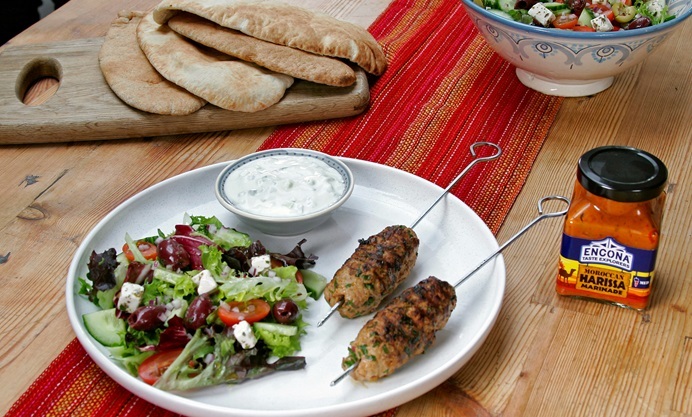 In the case of this recipe for Moroccan minced lamb kebabs, flatbreads or pitta breads are the perfect accompaniment, alongside a good spoonful of cooling tzatziki or Greek yoghurt. Minced lamb is mixed with chopped red onions and plenty of parsley as well as good dollop of harissa marinade, which results in a mildly spiced kebab that is perfect for all the family. If you are not a fan of lamb, then minced beef or a mixture of beef and pork are great alternatives and marry particularly well with the harissa marinade, as well as the spices that are added to the kebab mixture. You can make these kebabs the night before, and just pop them in the fridge until you need to cook them – they can also be frozen for up to three months.